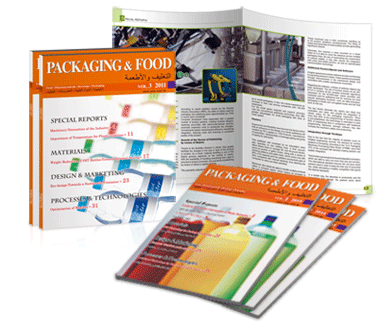 The Packaging & Food (PF) magazine is a specialized business magazine that provides information about the latest developments and technologies in the Packaging, Printing, Plastic and Food Industries. PF readers are widely distributed over various trades, such as wholesalers, importers / exporters, suppliers, manufacturers, trade association, chambers of commerce and so forth. The magazine serves as a reference tool in their projects to learn about the latest equipments and services provided by other companies involved in the Packaging, Printing, Plastic and Food Industries. It is circulated to the desktop of leading decision makers engaged in the above mentioned industries throughout the Asia and Middle East countries and is published on a quarterly basis (four times a year) in English language with the Arabic text presented alongside. 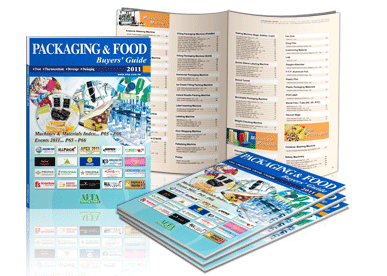 Circulated on a yearly basis, Buyers' Guide is an annual serving as a bridge between buyers and sellers in the industry of packaging and food. Giving away freely at myriads of tradeshows around the world at all times of a year, it not only makes it easier for companies to have access to their potential buyers, but also save plenty of time for those who visit the tradeshows with the hope of finding the ideal products on their mind. By placing an advertisement in Buyers' Guide, companies can greatly reduce their cost in promoting their products with almost the same effect as actually participating in the tradeshows themselves. As long as companies make good use of Buyers' Guide, traveling and shipping expenses will no longer be a heavy burden for most of them. As a result, they could be highly cost competitive in the market. In addition to reducing the cost, Buyers' Guide also makes it easier for potential buyers to collect much more systematically the information of the companies in the industry of packaging and food in that they are all included in one book. The convenience it brings about greatly increases the opportunities for the ad of every company to be viewed carefully and repeatedly. Furthermore, Buyers' Guide in the meantime facilitates the cultivation of the markets around the world by sending the right information to the hands of buyers in a wide range of counties, which are generally considered of great potential, Asia and the Middle East in particular. With an ad in Buyers' Guide, opening markets outside your home country has become easier than ever. For all those reasons, more and more companies choose it as an efficient tool to help achieve their ambitious goals. Special Reports Challenges in the machinery for the E+E industry Market trends for A&B label Innovations for food processing machinery Perspective of plastic packaging industry Distributed free in various trade shows. Buyer’s guide is an efficient guide for buyers to find what they are looking for, and it also provides a wonderful path for companies to reach potential customers. Its readers include both exhibitors and those who visit the trade shows. It serves a two-way medium for buyers and companies to strike a deal, and further creates a win-win situation for the two parties involved. Design & Marketing The impact of the smart packaging in A&B industry Neuromarketing & Packaging Nanotechnology applied to packaging How the shape of packaging influences the perception of sweetness and acidity?